Many of the boats are used for day sailing, though a proportion of the members enjoy weekend cruises and a few cruise for a week or two at a time. There are a few who participate in racing around the cans and others who prefer passage races. To complement the sailing activities at RSC, the Club provides the facility for moorings to be laid for club members use. At present an area of fundus is rented from Carrick in which a limited number of 80 moorings may be laid. The area extends in front of the clubhouse to the far side of the channel with the depth varying from about 1 '6" to about 5'. with varying depths in between. The Club imposes a limit of 4'6" draft and a maximum length of 31' sailing boats. The members using these moorings are divided between owners of cruising boats, small day boats and a number of racing boats. The moorings are divided into seasonal moorings and annual moorings. Seasonal moorings are laid from the first of April and are removed by the first of October. The work is carried out by a contractor who is engaged by the club and the mooring blocks and chains are left on the beach for the owners to retrieve what tackle they wish. A limited number of annual moorings are left in situ for the use of owners for the full twelve months. The blocks and tackle belong to the mooring holder and they alone are responsible for its condition and upkeep. 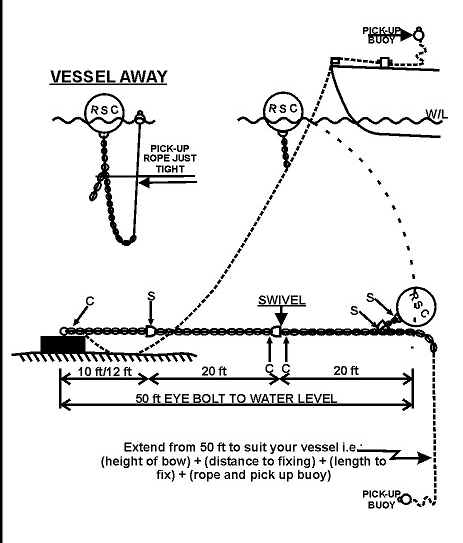 The mooring master will allocate suitable mooring spaces. Priority is given to existing mooring holders who pay their subscriptions by the end of January. After that date allocation is on a first come first served basis. 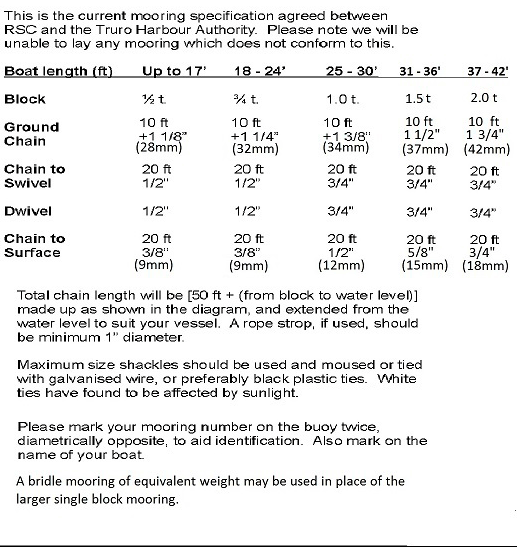 'Chains on day' is held on a Saturday in March when there is a suitable tide and mooring holders attach their chains and tackle to their mooring blocks. These are then examined by the mooring master and if passed will be laid by the contractor. Any defects can be remedied on the day. Any moorings found to be below the stand-ard required will not be laid. Annual mooring must also be inspected by a competent person at the start of each season. This is usually done by the contractor. Prior to the chains-on day an evening social meeting is held to welcome new mooring holders and offer advice and tips.